"Sometimes people accuse us of terrible things," laughs Reed Martin. Pushing aside his iced tea, he leans forward conspiratorially. "Apparently," he says in a hushed whisper, his voice full of drama, "we've mocked William Shakespeare." And that's just the tip of the ice cream cone. The allegations against the Reduced Shakespeare Company, over the years include the ridiculing of religious texts, playing fast and loose with beloved American icons, contributing to the dumbing-down of American culture and actively decreasing the attention span of the average theater-going audience. "Sometimes," Martin nods, "people actually us ask if we don't feel bad—if we don't feel a little guilty—for mocking Shakespeare, for making fun of the Bible, for everything we do. And my response is basically, 'Uh, no.' I like to watch serious Shakespeare, but I also like a good loud laugh. And with us, you get a little of each." A lot of each, actually, as anyone knows who's ever seen the Reduced Shakespeare Company in action or caught a production of one of their many popular shows: The Complete Works of William Shakespeare (Abridged), The Complete History of America (Abridged), The Bible: The Complete Word of God (Abridged) and four others, with a new one, The Ultimate Christmas Show (Abridged), due to begin workshops at Napa Valley College later this month. "I don't know. I certainly hope we aren't dumbing-down our material in the interest of getting laughs," muses Martin, who lives in Sonoma and who has co-authored every RSC show except the original Shakespeare production. "On the other hand, there are some pretty dumb jokes in our shows. But there is a lot of smart stuff in there with all of the stupid stuff, so I like to think what we do is mask intelligent theater in ways so it doesn't seem like it's all that intelligent. Of course, people's attention spans are shorter these days, but," he laughs again, "I don't think we can really claim to have caused that." 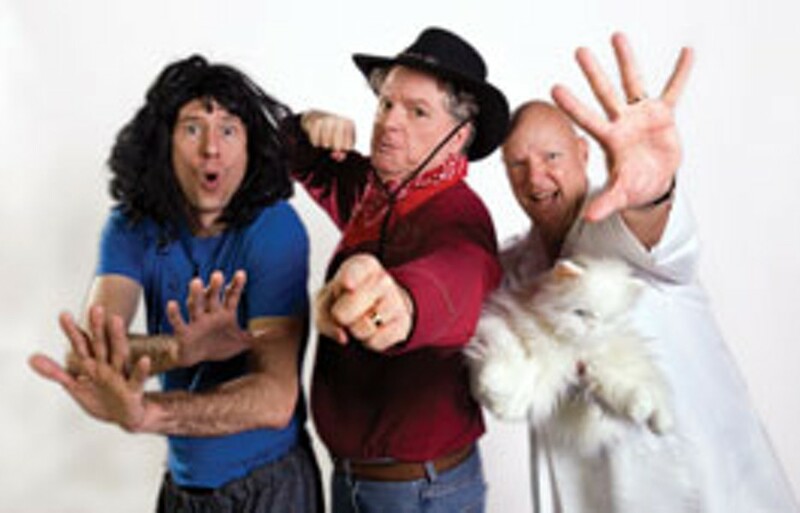 What the Reduced Shakespeare Company can claim to have created is one of the most popular traveling theater troupes in the country and, with The Complete Works of Shakespeare (Abridged), one of the most widely produced comedy plays in the world. Not bad for a company that was formed as something of a lark, performing condensed Shakespeare plays for tips at the Renaissance Pleasure Faire. Last month, the RSC marked the 30th anniversary of that very first Ren Faire performance, which took place Aug. 8, 1981, at the Caravansary Stage, performed to a spotty crowd of delightfully scandalized revelers seated on hay bales under an awning of trees. Using the pointedly cheeky name "The Reduced Shakespeare Company," four actors staged Hamlet as a rip-roaring, speed-metal spoof, condensing Shakespeare's epic to 25 brilliantly abbreviated minutes. By the time the fair ended six weeks later, the foursome were playing to cheering, overflowing crowds, and an unlikely institution was born. "That was before my time, of course," acknowledges Martin, a classically trained actor and former Ringling Bros. circus clown who today, with actor-author Austin Tichenor, co-owns and co-manages the RSC. Martin didn't join the company until 1989, when founder Daniel Singer left to become a full-time designer of theme-show attractions at Disneyland. Since, Martin has co-written seven of the company's eight traveling shows, most of which have been published and licensed for production by amateur companies. The company's popularity has fluctuated over the years, but at times it has operated three separate teams of actors traveling the globe with their patented approach to the world's weightiest subject matters. They had a popular radio show on the BBC, have made regular appearances on NPR and can right now be heard several times a day locally on KRCB-FM public radio. For 10 years, the company operated a team in London, where they presented one of the longest-running shows in the West End. Today, there are usually at least two RSC troupes performing somewhere in the world, culled from about a dozen performers who know the shows and can be paired together to meet the needs of any booking. Add to that the various published "reduced" scripts now part of the theatrical fabric of the universe, and there is a never a time when someone, somewhere isn't performing a show originated by the Reduced Shakespeare Company. But it all began with that first ridiculous Hamlet, co-written and performed by Jess Winfield and Santa Rosa's Daniel Singer (who at the age of 18 founded Sonoma County's General Amazement Theater Company), with Michael Fleming and Barbara Reinertson rounding out the cast. Adam Long, in a series of dresses, would become one of the company's most influential members, joining the company that first year after Reinertson broke her ankle. Long's involvement kickstarted an RSC tradition of always having a man in drag in the show. In 1982, the company returned to the Ren Faire with a reduced version of Romeo and Juliet, building upon their growing reputation. But at the Edinburgh Fringe Festival in 1987, the RSC premiered the show that would transform them from a group of pass-the-hat players into a professional troupe. The Complete Works of William Shakespeare (Abridged) was so well-received that the company was to start touring and rapidly building a reputation as a major player in the New Vaudeville movement that included such acts as Penn and Teller, Avner the Eccentric, and the Flying Karamazov Brothers. History, as they say, was made. The 30-year milestone was celebrated last month—suitably enough, with 30 years reduced to a mere three hours—as several members, past and present, gathered to reminisce in a live webcast held just a few yards from the spot where the original company members made their outrageous debut. An edited version of the conversation can be found on the company's website, and as an overview of the history of the Reduced Shakespeare Company is vital information for any fan who's wondered how the company came to be. Ironically, the wild and wooly webcast—featuring Singer, Winfield, Martin, Tichenor (who joined in 1992, when Winfield left the company) and Sa Winfield (the group's early costume designer), took place in the board room of the Stonetree Golf Club, which now stands where the Ren Faire once sprawled at Black Point. "That reunion was a blast," says Martin, who is putting the finishing touches on the new Ultimate Christmas show, which he and Tichenor are writing and directing with a cast of local actors before taking on the roles themselves in Lowell, Mass., this November. In October, he and Tichenor head to New York for a run of The Complete World of Sports (Abridged). But today, he's in a reflective mood, enjoying the buzz that comes with celebrating an unexpected milestone like the 30 years of the RSC. "In America," he continues, "theater people have heard of us, and plenty of people have heard of the shows, because so many Shakespeare festivals and colleges and community theater companies perform them. But I'm not sure the Reduced Shakespeare Company itself is exactly a household name or anything, not among the general populace." "That's what I hope, anyway!" The workshop production of 'The Ultimate Christmas Show (Abridged)' runs Sept. 23&–Oct. 9 at the Napa Valley Conservatory Theater. 2277 Napa Vallejo Hwy., Napa. $15&–$20. 707.256.7500. napavalleytheater.org. The Reduced Shakespeare Co. is found at reducedshakespeare.com.